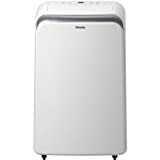 Danby - DPA140B1WB : Portable Air Conditioner Review • The Air Geeks, reviews of air conditioners, dehumidifiers and air purifiers. The DPA140B1WB is a strong air conditioner that offers a superior cooling capacity of 14,000 BTU. This cooling unit is suitable for medium and large rooms. Apart from cooling your room, this unit features a built-in dehumidifier that ensures that your room has the desired relative humidity. 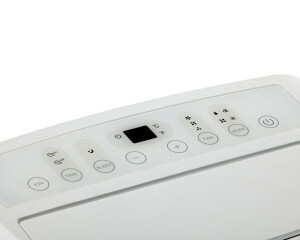 In addition, this air conditioner uses environment-friendly components. Are you looking for a suitable cooling unit for your office, bedroom, garage, computer room, et cetera? If you have already identified this unit and you are interested in knowing if it is a suitable solution for your cooling needs, then you are in the right place. We have thoroughly researched to provide you with accurate information about its performance, features, strengths, and weaknesses. To start with, the DPA140B1WB offers an impressive cooling capacity of 14,000 BTU. This high capacity makes it a suitable option for medium and large spaces. According to Danby, this air conditioner is suitable for spaces that are as large as 700 square feet. However, we have observed that this unit offers best performance when it is used in smaller spaces. Apart from cooling your room, this portable air conditioner features a built-in dehumidifier to ensure that your room has the desired relative humidity. It is capable of pulling up to 54 pints of water in a day. If you have been struggling to control excess moisture, this unit will help to transform your room into a place of comfortable environment. The electronic controls of the DPA140B1WB are designed to allow you to control the environment of your room with ease. It features a user friendly interface, an LED display, and an integrated remote. In case you are looking for an air conditioner that you can easily push from one part of your room to another, then this unit is a suitable option. Its castor wheels and handles allow users to move it with ease. The DPA140B1WB uses environment-friendly components that don’t contribute to the degradation of our surroundings. Although the manufacturer indicates that this air conditioner is an energy efficient appliance, we have noted that it has higher power needs than most units of same capacity. If you are looking for a system that consumes minimum power, then you may need to think about another brand. The performance of air conditioners depends on the design that they are based on. In terms of performance, dual hose air conditioners are faster and more effective. The DPA140B1WB is based on a single hose design. From our research, we observed that the performance of this 14,000 BTU unit cannot match that of dual hose brands. The window venting kit of this air conditioner is expandable and can fit in most slider windows, double hung windows, and sling glass doors. It fits well in 26.6″ to 49.2″ windows. For easy installation, you should have the measurement of your windows to avoid unnecessary headaches. Effective when installed in small rooms. We noted that this unit delivers impressive performance when installed in small room (150-300 square feet). Portable and easy to move. Its castor wheels and handles allow users to move it with ease and convenience. You only need to lift it when taking it upstairs or downstairs. This air conditioner is based on a single hose design. This design impacts its performance negatively. Dual hose air conditioners are faster. Produces a loud sound. Compared to other brands of same capacity, this air conditioner is noisier. Higher power consumption. We compared the electricity consumption of this air conditioner with that of other brands and noted that its power needs are higher. It is an unsuitable choice for people who want to save money. Also, Poor hose and attachments design. The attachments are poorly designed and don’t fit properly to make strong joints. We have an older Danby air-conditioner that works wonderfully. We bought this model for our 500 square-foot exercise room, But it never did cool the room down even after an hour and half." Works but not for 650sq. ft. More around 500sq. ft. It is quite loud even when only the fan is running. The window vent kit is not very easy to use and you do need to drain it." The Danby DPA140B1WB is a portable air conditioner that offers impressive features such as a high capacity and a large cooling space. This unit is suitable for cooling the air as well as ensuring that your room is free from excess moisture. When installed in a space that is smaller than the recommended size, this unit delivers impressive performance. Although this unit has some good features, we have noted that its attachments are poorly designed to fit well during assembly. Our research on its power requirements revealed that it has higher power needs as compared to other air conditioners of same capacity. Are you planning to install it in a quiet place? If that is your plan, you need to think about another brand because this unit produces a loud sound. Otherwise, a good buy according to us.